Many years back I watched a video that described the trick to cut crown molding. I believe it was an episode of this old house back in the 1990’s that featured Tom Silva. I have learned more simple handyman tips over the years watching Tom Silva than any other resource. They are simple, and stick with you for years. I felt the need to write this post after recalling a couple of incidents. One was with a DIY’er (my brother) and the second was with a professional contractor. The first incident was with my brother when he was left alone to replace crown molding in a room that was just painted (painted after filling in the grooves in paneling, and yes, it turned out great). My brother was left alone to handle the crown molding in the room and he was left with plenty of material and a compound miter saw. Now, many of you will know that many miter saws come with a guide to cutting crown molding. The guide below is for “no blade tilt”, but the guide I am referring to has a setting for both the miter and the bevel. 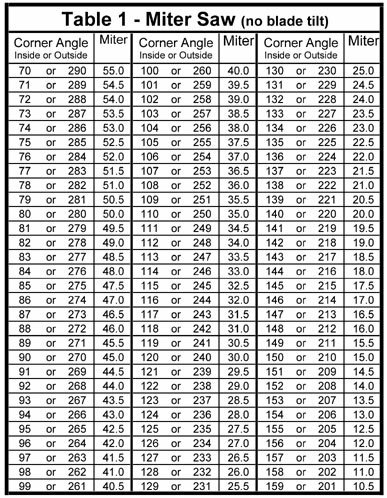 Well, those charts are very helpful if you have an angle that is not a 90 degree cut, but the “trick” to make the cut for a 90 is so simple, you can throw the book out. My brother was left for about 4 hours and when I returned he had 2 pieces of molding up and exclaimed that he spent the last couple of hours trying to figure out the proper angles. Keep in mind this was a rectangular room of about 14×20 (not much to it). When you are cutting trim or molding it is surprising how much of a difference that 1 degree can make. Pair that with the extreme change when altering 2 planes and confusion sets in. Sadly, the second incident was with a “professional” contractor. The contractor was renovating a kitchen for a local lottery winner. No kidding, that is the real story. He won the lottery and remained in his 900 square foot ranch home built on a slab in an area that regularly has a flooded street (unless the town comes and operates pumps during just about any rainfall). Well, I received a call from my brother who was working with the contractor (no not the brother in the above story). My brother explained to me that his boss has been trying to cut crown molding for some kitchen cabinets and they had burned through all of their expensive crown molding making mistake after mistake. He called me since the kitchen supply company was dropping the last piece of crown molding that they had in stock with that stain. As many of you know, the next batch from the manufacturer probably wouldn’t be an exact match and the homeowner did not want to the projects completion to be delayed an entire week due to an incompetent contractor. I stopped over showed them how to simply flip the crown molding, hold it in place on the miter saw and make their 45 degree cut. 10 minutes and the job was done. Meanwhile, there were 8 hours wasted and $160 worth of crown laying on the floor. The following video demonstrates crown molding cutting techniques for outside corners, inside corners and scarf joints. This video should save you a lot of time and give you a much higher quality project. How Do I Cut Crown Molding?